by Elizabeth Cadell. First published in 1960. This little book reminded so much of Mary Stewart! She was ready to put it aside as the hallucination her fiancé Charles insisted it was when, one day, her “hallucination” appeared at the door – in the form of a very real, rugged Naval officer! From London’s West End to the windswept lawns of a boys’ school in Sussex, Jody Hern untangles the bizarre mystery and the secret of her heart as well. If she had really fallen down those stairs, how could she have gotten a bump on the back of her head? And what had happened to make her feel that she had seen a man – a man leading a goat down a fashionable London street on which, she was certain, she had never walked? In her determined search for the solution to a frightening puzzle, Jody Hern finds the true meaning of love. An engaging little mystery and light romance. It kept me interested and turning pages. I enjoyed the characters and the fun, clever mystery! Hello, happy Sunday! I hope all is well in your neighborhood. It’s a bit cooler here but our skies are blue and cloudless today. We missed the snow they thought we were going to get over the weekend. It dipped further south and they got it in Chattanooga and north Georgia. Looks like another system, winter storm Stella, is coming in across the northeast on Monday and Tuesday though. It will miss us but hit both states where my sons live. The one in Maryland’s looking at 8-12 inches of very heavy wet snow! Guess he won’t be working for a couple of days as he works outside. The one in Pennsylvania will only get 4-6″. Moving to Tennessee was a good move I think! The new copy of The Sin Mark, I ordered for the dust jacket, came in! Lovely cover. I couldn’t wait to add it to Goodreads so a picture of it will be somewhere online! 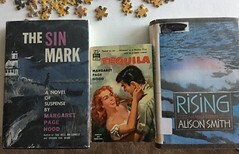 Tequila by Margaret Page Hood came in too. Now I have all her books. It’s a sweet little Dell paperback in excellent shape. Also Rising, the second book set in Coolidge Corners Vermont, by Alison Smith came in. It was a good week for mail! Nothing like finding a book in your mailbox. I’m adding a big picture of The Sin Mark cover back in the post with my review if you want to see it up close. We had a new feathered friend visit last week, a yellow-bellied sapsucker! First time I’ve seen one. It’s a little on the larger size and he’s been here most everyday this last week. Haven’t seen him at the feeders just pecking at the tree trunk. Son in Maryland said he is just drinking the sap, it doesn’t mean my tree is dying or anything. He is an arborist, when I said I wish the Pileated woodpecker would visit my trees he said ‘no you don’t, when a woodpecker is busy in your trees its not a good sign of the health of the tree!’ So I was a little worried about my pecan tree, it is the feeding station for all my feeders after all! The mockingbird is still around but not quite as vigilant as he’s been. He’s letting the other birds eat at the feeders but guards the suet cakes. The woodpeckers loved them and I miss seeing them everyday. I’ve been busy volunteering at our local library book sale. We are sorting books now. The sale is May 4-6. I go up 3 days a week and sort for 3 hours. It’s fun and I like the gals I work with. We get to put books we want aside in a box with our name on it for the sale. My box is full already and I’ll have to start another one soon! I found six Elizabeth Cadell books! I’ve read her first book, My Dear Aunt Flora and liked it, but have only ever come across one other, which I grabbed up! Nan over at Letters From a Hill Farm turned me on to her. Her books are lighthearted, humorous, romances. I see there is one mystery she wrote in the 50’s but never published and her daughter has published it along with a biography but it’s $39.95 and I’m cheap! Have you read any Elizabeth Cadell? her head laying down on her thigh! She very rarely lies down let alone lay her head down. 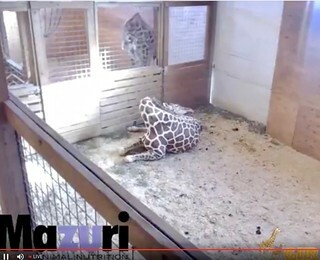 They only sleep about 2 hrs. a day and then in 10 minute or so catnaps. Don’t you wish you could get by on so little sleep? If you want to check on her click the link above. I’ve had the temporary crown on my tooth for two weeks this Tuesday and suppose to get the permanent on then. I’ve had quite a bit of aching and discomfort from it. My dentist’s receptionist scared me to death and said I shouldn’t have any pain it must be cracked! Go back to the man that did the root canal! I felt like my dentist who did the temporary should have me come in and look at it first before I did that! I finally called the endodondist and asked them what they thought and they were so professional and kind. There are lots of little things it could be that are not a worry at all. Air gets inside the crown and causes discomfort, food particles get in, sometimes they leave a little tiny rod in there that is suppose to come out, the temp is thicker and causes gum discomfort that some people are more sensitive too. As long as there is no darkening of color, swelling, drainage etc. I should be fine. Why couldn’t my dentist tell me these things? I think I’ll be looking for a new dentist. I spent 4 days worrying sick that $2,000 later I’d have to have the tooth pulled after all. We’ve been bowling a couple times in the last week. Its been so long since we bowled. I forgot how much I enjoy it. Our bowling alley is in a terrible state of repair, but it’s all we have. Yesterday I beat Bossman all three games! I rarely beat him, let alone three times in a row! Do you like to bowl? I tried a new pie recipe today. Coconut-Pecan German Chocolate Pie. DELICIOUS! I love German chocolate cake. If you do too you’d love this pie. We also had that Mississippi roast recipe that is everywhere online. It was so good! Leftovers will be used in burritos later this week. What’s your favorite pie? I love pie! Have you made anything new and exciting for dinner lately? What are you reading now? I’m reading The Silver Darlings by Neil M. Gunn. 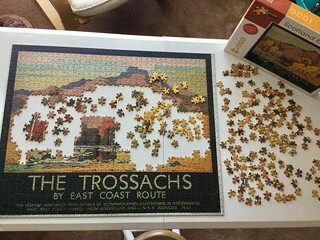 A wonderful Scottish book set on the northeast coast after the clearances. The fishing industry is just getting started and herring is the big catch, those silver darlings are going to make men rich! It’s a really good book with beautiful language. We’re doing a read-a-long on Goodreads with it. Well, thanks for coming by and visitin’. See you later! Elizabeth Cadell (A.K.A. Harriet Ainsworth) was born in 1903 in Calcutta, India. During the Great War she studied music in London, but refused a musical career and returned to India where she married and had two children. After she was widowed ten years later, she returned to England. 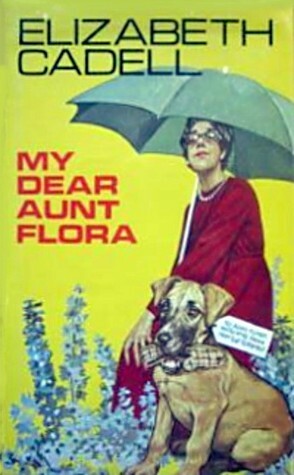 Elizabeth wrote her first book ‘My Dear Aunt Flora’ during the Second World War in 1946, thereafter producing another 51 light-hearted, humourous and romantic books which won her a faithful readership in England and America. She moved to Portugal in 1960 and subsequently set many of her books in that country. 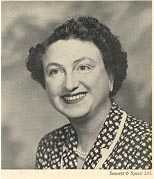 She died in 1989, aged eighty-five. This was my first E. Cadell book and I thoroughly enjoyed it. Written in 1946, it is a pastoral, feel good book full of light humor. Jonny (Jonquil) and Phyl, her sister-in-law are widowed young. Jonny has 2 children. They decide to move out to a large farm house in the middle of nowhere left to Jonny by her late husband. They invite Aunt Flora to come live with them. Flora raised Phyl, Hugh (Jonny’s husband) and George. I loved Aunt Flora and Jonny. I would love to trade lives with Jonny! I think it might even be worth having to live with an outside potty! There is a great gang of kids that are always in and out with much mischief and of course dogs! Rex, the Great Dane being the best! Phyl on the other hand would be a thorn in my side. She never lifts a finger to do anything, always lounging somewhere or sleeping till noon. But because she is beautiful and kindhearted everyone excuses her. Brother George comes for a ‘rest’ and thoroughly upsets their peaceful existence. He is demanding and grumpy. Throw in beautiful Angela Reynolds who comes for the summer and Brian Lorimer, a longtime ‘pursuer of Phyl’s and you end up with a wonderful hilarious romp. Brian is such a wonderful addition to the little group with his humor and lighthearted take on everything. The book ends with a wedding, who’s I’m not telling you’ll have to find the book! Thanks to Nan over at Letters from a Hill Farm for recommending it! ‘Death and Miss Dane’ a never before published book by her and a biography by her daughter. 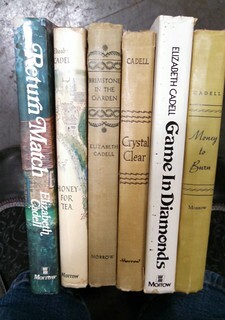 elizabethcadell.com Be sure and check out the page ‘dust jackets’ for a great view of all the dust jacket from her books! If you’ve read a Cadell novel leave a comment and tell me which one and what you thought of it!